Welcome to the lovely land of Body Horror. Simply put, this is any form of Horror or Squickiness involving body parts, parasitism, disfigurement, mutation, or unsettling bodily configuration, not induced by immediate violence. For example: Being shot in the chest and having your organs exposed is Bloody Horror, not body horror. Turning into a monster is a Baleful Polymorph, but still not a body horror. Having your chest tear open of its own free will, exposing your organs as your ribcage is repurposed as a gaping maw full of bony teeth? That is Body Horror. This trope is difficult to pin down, as it has a wide range of potential applications and invocations, but what they all hinge upon is the Primal Fear of the Uncanny Valley, deformity, parasites, contamination, the ravages of disease, and the aftermath of bodily injury. The mind knows on a deep instinctive level that faces should have eyes and hands should not. Organs and bones belong on the inside, and parasites and circuit boards do not. Bodies should be roughly symmetrical and have logical proportions. And nothing should ever look like this page's example image. Slowly mutating in a sickeningly twisted and deformed manner after contracting The Virus, a close encounter of the squick kind leaving someone the incubator for a Chest Burster, a rotting zombie, an Eldritch Abomination resembling a tangle of organs, and a shapeshifter abandoning any attempt at aesthetics or imitation to become a writhing mass of random but recognizable parts are all examples of Body Horror. Obviously, as a trope based on Primal Fear, body horror is Older Than Dirt. For a character or Mook who has this as their back story, see Was Once a Man and Tragic Monster, and/or The Grotesque. If Body Horror is played for sympathy, it can be used to explore the issue of What Measure Is a Non-Human?. It can result in And I Must Scream if the victim is aware of their condition but totally helpless. Using this trope can result in Our Monsters Are Weird of the most horrific kind. Sub-supertrope of Evil Is Visceral. Beauty to Beast - Making Casual Friday look very smart indeed. Bloody Horror - Horror involving blood used in ways for which it was not intended. Body of Bodies - When you can't decide on just one, wear them all. Brain in a Jar - The ultimate beauty in a bottle. Brain Monster - A monster that is a brain, or has its brain exposed. Creepy Long Fingers - Permanent, personalised chopsticks. Creepily Long Arms - Perfect for long-sighted reading. Unwilling Roboticisation - Being forcibly converted into machines or robots. 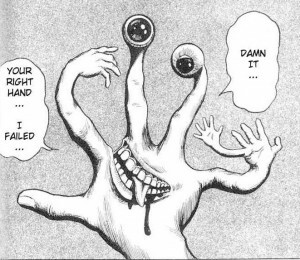 Evil Hand - In body horror, transplant receives you! Eye Scream - Horror involving injury to the eyes, usually with gruesome results. Eyes Do Not Belong There - Or there. Or there. And definitely not there. Facial Horror - Gruesome disfigurement of someone's face. Flesh Golem - MacGyvering meets Necromancy. Fold Spindle Mutilation - Fitting a person-shaped peg in a round hole. Human Architecture Horror - Bodies fused with their surroundings. Independent Limb - Just one body part out on its own. Lovecraftian Superpower - Some superpowers can be awkward. Marionette Motion - When bodies should not move that way. Meat Moss - When body horror meets interior decorating. My Brain Is Big - Extensions with a difference. Orifice Invasion - A creature will get inside you through a convenient opening in your body. Power-Upgrading Deformation - The good news is you can now run twice as fast... the bad news is that it's because you've got twice as many legs. Sculpted Physique - When your blind date turns out to be a literal brick house. Shapeshifter Mashup - Become ALL of the things!... at the same time. Too Many Mouths - Mouths don't belong there. Belly Mouth - Or there. Nested Mouths - Or inside of other mouths. Torso with a View - Goes right through you every time. Transformation Horror - Don't look at me while I'm changing. Transformation of the Possessed - Side effects of possession may include musculoskeletal distortion, vestigial limbs, and premature wrinkling. Womb Horror- Horror to do with pregnancy and birth. Appendage Assimilation - Do-it-yourself transplants. Auto Cannibalism: When Horror Hunger isn't just limited to other people. The Assimilator - Resistance is futile. You will become body horror. Bio-Augmentation - Extreme botox as a hobby. Biomanipulation - Who needs tools to make body horror, you've got superpowers! Body and Host - Keeping friends or enemies very close. Came Back Wrong - A common cause of several forms of body horror. Captured Super-Entity - Why Mr. Health Inspector, of course we aren't experimenting on captive aliens here! Mainlining the Monster - Its not like the wonderdrug comes from draining some creature of its bodily fluids! Fetus Terrible - Raising young to be just like your nightmarish self. Nausea Fuel - I think that food is coming back up. Organ Autonomy - When organs act on their own volition. Organic Technology - "Tech" that is made of flesh can reach Squick territory. Personal Horror involves this in some variants. Tarnishing Their Own Beauty - The more extreme cases can result into this trope.